We made it! We got to week 35! This is a huge milestone for us! Zander was born at exactly 35 weeks. Celebratory dance is mentally happening right now, as this is not possible for my bedrest stricken body! But first off, let me say that I am so madly in love with our dear children. I cannot fathom life without them and one isn't even out yet! lol. Just the thought of her makes me so excited to meet her, hold her, kiss her and smell her for the first time! So many 'firsts' to look forward to! But I also want to be honest and say how this pregnancy journey has been in hopes that some women know they are not alone if they didn't have the ideal pregnancy. So I'll start by saying that I have determined that pregnancy and me are sadly not a match made in heaven. We often get on each other's nerves as there has not been many great days at all. And this is not to complain but just to share my personal journey, as I stated. And I want others to know that even if you don't have the ideal pregnancy or birth that it also doesn't mean you are not meant to be a mother. And there should be no shame or guilt in not being the "typical" or having a bad experience! You were made to be a mother, whether it's through your own body, through surrogacy, through good or unfortunate experiences or the beautiful gift of adoption! So back to my journey... It started out pretty typical. I felt good for a week! Haha. Thus started the first phase of this pregnancy: NAUSEA! And whoever termed it "morning sickness" was sadly mistaken on this name. It was all day, every day from week 6 to week 19! What some people also experience is something called 'after-taste.' Every single thing I ate, tasted like mercury 10 minutes after I ate it. It makes no sense to me why this happens. But I kept (and still keep) a tooth brush with me everywhere I go. And with the nausea, I often ate my food on the floor because it felt like I wouldn't vomit immediately if I quickly laid down. So strange, I know! The carpet and I were very familiar with each other. It's oddly weird to not feel like you can function with something supposedly as simple as wanting to vomit all day. But don't let nausea fool you - it's very debilitating. During this phase, I also developed nose bleeds! I have never had one in my life and I cannot tell you how scared I looked when I ran to Dan with blood streaming down both nostrils many times. It was so bizarre! Thankfully my sis is a pro at knowing how to stop them. Then came week 20, the one week that felt so good! It did exist, It wasn't a myth - I cannot deny that there was a week that was heavenly! And I got excited about baby and wanted to buy cute girly things. Then, the next 'painful' phase happened to start during Dan's birthday. I started getting horrendous back pain and early contractions and it was apparent a week later that neither of them were going anywhere for the duration of the pregnancy. It appears the back pain started because we found out that I have scoliosis. Which we never knew and my back is badly misaligned, we can't do an MRI until after baby to see how severe it really is. Which explains why I can't stand or sit more than 20 minutes without being in awful pain. But it's also hard on my back because I thankfully have been gaining weight this pregnancy - a huge silver lining since last time I barely gained weight as wasn't able to eat without being in pain. As for why I get contractions early, The Doctors don't have an exact reason. Some women just experience them earlier. But I'm so happy I found a great Dr that cares about me and checks me weekly. And with the idea of taking it "easier" my hubby took on the challenge of rushing home from work each week night to make us all dinner and then play with Zander so I could stay off and rest my back. And my mom and sister started helping with Zander as I started seeing a Chiropractor 2 times a week, a PT once a week and my weekly Dr visit. I honestly just have been going to Dr appts, but that's what my body needs! With this I was able to maintain a good cervix length amongst the awful pain for a while. And I have to say, being on modified bedrest ain't easy with a toddler! I honestly don't know what I would do without help from these amazing people! This pregnancy has truly taken a village and I'm not going to feel guilty about it! I'm so so grateful to them all! Not to mention the love, prayer and food we have received from our amazing and dear friends. And one of my dearest friends threw me a "Sprinkle!" I had no clothes for her (I can't walk around stores anymore) and now I have tons through the party and borrowing a box full of cute clothing from again - amazing friends! We are blessed amongst the pain and adjustment that this family has faced. But the boys have been amazing! Zander is the most excited about baby girl. He loves feeling her kick, he tells her that he loves her all the time. And he tries waking her to say hi when she's not kicking - often saying, "Baby, you in there?" And he is so happy to have a say in her name options too! He is always saying, "What shall we name her!?" We all have 2 favorite names now but prefer not to share until she's here. People are so VERY opinionated about names and pregnancy. Which is why I want to be honest about my pregnancy - I dont want to feel shame this time around about how "it's" going. This is not a cake walk! There are less than a handful of women I have talked to that "loved" being pregnant. I seriously try not to make a bad face when I hear their experience. Mine is just different. And there has been two important life lessons I've learned with this pregnancy. 1. Never, ever compare your pregnancy or birth to anyone else's. "Comparison is the thief of joy." - Theodore Roosevelt. Once you start comparing, you get sad, jealous and can't find any joy in your circumstance. I admit this happened during this pregnancy as someone shared their beautiful story and then wanted to hear Zander's story. It threw me back into depression, as she suggested all these things I should've done. It also made me feel inadequate and that I wasn't meant to be a mom because I didn't have this blissful event. Mine was painful and sad and this pregnancy is also not ideal. Thankfully, I remember my tools to help find "my" thankfulness which always helps lift me out of my pity-party (as my dad always called it). which leads me to 2. I have to choose to be "Thankful Through the Pain" every single day. It's often an hourly struggle as life and easy things are no longer easy. And I often cry because the pain is so real and sometimes words of encouragement are left at the wayside. Not on purpose, our family is just trying to survive right now with one less adult to help life have balance. But I have already grown so much in this. My challenges have made me stronger and taught me to ask for help, which I never do. I really do look forward to helping someone else in the future with a similar experience! I'll be able to validate all their feelings and support them through their journey and tell them they are not alone. So as we enter week 35, the pain is still here, I still get awful contractions and I am dilated 1 cm. BUT my Dr has been amazing and we have great plans in place for whatever happens next. I also have all the lovely other symptoms of third trimester; the bad heartburn, the constant peeing, round ligament pain, sciatic pain, swollen legs and the insomnia to name just a few. We also found a great Doula to help us with a VBAC birth and I now see the Chiropractor 3 times a week to stay on top of the pain a bit. We have decided this week to take things very easy, letting this little and sweet bambino to cook as long as she can! Asking for help whenever possible and staying off my feet as much as I can. Which has resulted in an Indiana Jones marathon and I'm sure many more marathons to come. The Dr and our big goal is 37 weeks! But to be honest, we're very grateful for every single day that passes! 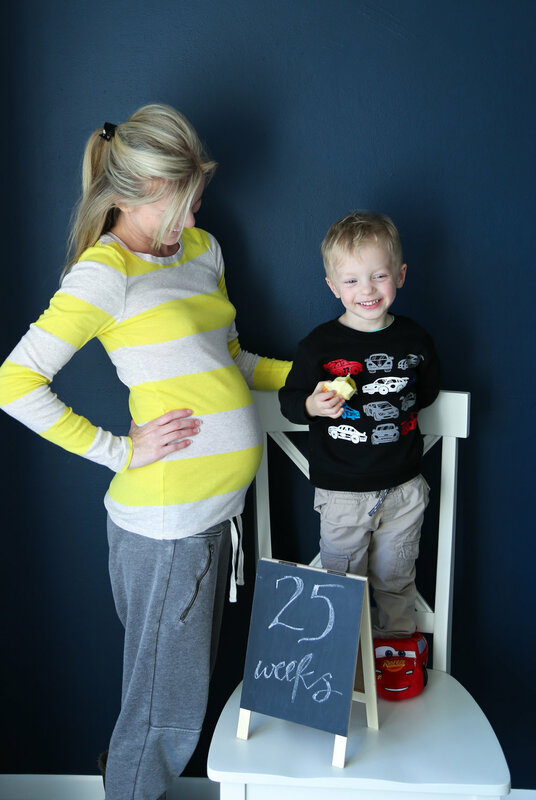 But ya'll, 37 weeks is two week away! It's so crazy to think she could be here that soon. And nothing is ready for her! But I did finally pack a hospital bag, a huge win since I never did last time. And I did use my handy amazon ordering skills to order the rest of her room, which we are hoping to put up this weekend??? So there you have it, this is what pregnancy looks like in our household. It's not glamorous, it's not this blissful event but we choose to find thankfulness through the pain. And even though I'm in pain, I want to look back and remember that it's all worth it and I'm no less of a women because my pregnancy or birth looks different from others. This is one proud mama of where we are and who is very excited to meet her baby girl and love on her to no end! And 'Thank you' Kaitlyn for taking these impromptu 35 week photos! I finally compiled all the weeks I actually captured. Man, it's so hard to remember anything these days - esp with a toddler and baby brain!